Desperately Seeking Adventure: Lhasa, Tibet: Heaven On Earth! 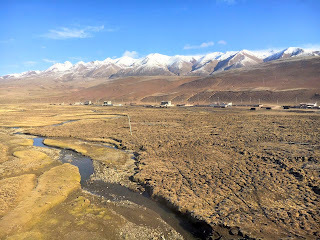 Tibet was the big one, the trip that almost didn't happen, through the craze of cancellations I made my two day journey to the Tibet Autonomous Region from Wuhan, China at the end of last month. Taking one flight and an overnight train beginning in Central China to the Wild West of Tibet took some going, it was an experience for the better! That upper bunk was insane! Securing some extra days off work I was enabled to book the trip of a lifetime to Lhasa, Tibet. Choosing Tibet Vista didn't take much thought as the itinerary and date worked for me just fine. Deciding upon the four day Lhasa short trip I was excited to see the main highlights that the holy city of Buddhism had to show me. Booking a train from Wuchang to Lhasa would of taken me two days but I got dealt a bad card, the travel company who took care of the train tickets let me down majorly, calling up on my Tibet Vista advisor, Jim Pel suggested that flying from Wuhan to Lanzhou then taking the overnight train to Lhasa would be the best bet! The day arrived for me to jet off to Lanzhou, boarding my Hainan Airlines flight from Wuhan was a breeze, no stress. Descending into Lanzhou Zhongchuan Airport in the dead of night was exciting still, the landscape was heavenly! Was it still China? It was the Tibetan Autonomous Region! Waking up bright and early in my Lanzhou hotel I was pumped for my first sleeper train experience in China. 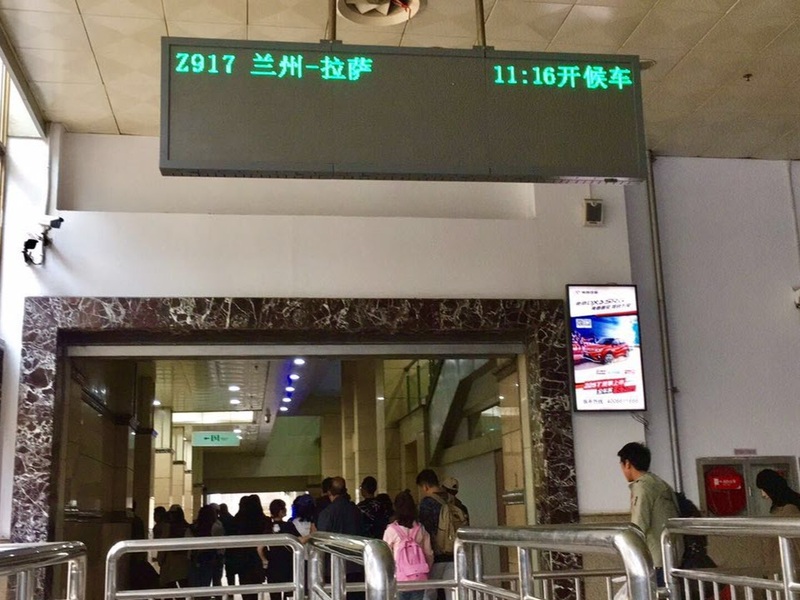 Choosing the Hualian Hotel was a winner, located within a stones through from Lanzhou Railway Station I was afforded more than six hours sleep due to its convenient location. To think I was only halfway at that point did blow my mind a little! Producing my Tibet Travel Permit to the ticket guard to retrieve my ticket was an unnerving moment as she took the document and my passport off for inspection. Packed with some snacks I missed my chance to try some Lanzhou noodles but I was all about boarding my Lhasa bound train. 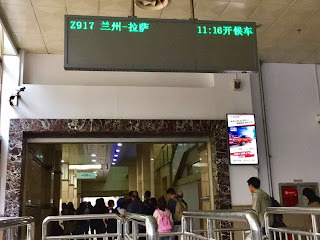 Z917 was due to depart at 11:16 and it sure did just that, scrambling under the platforms to platform five was an effort but I was on-board after another short inspection, my Chinese language skills were being pushed to their limits! I was bound for a twenty three hour and fifty five minute train journey that would arrive into Lhasa the next day at 11:10 in the morning! Lanzhou would be seeing me again for some of that mian! But let me just get myself together! Just embrace it! So, the hard sleeper cabin looked fine from the outside, not much different compared to the soft sleeper apart from the upper berth, trust me to have been allocated one of those for my first overnight train! I'm not most agile of people, in-fact I'm damn right awkward but I got a grip of that situation, with the help of a Chinese guy who looked around my age I had my important bag stowed away at the foot of my bunk, but there was no ladder to reach the bed so I had to climb at least ten foot to the top each time I needed to get back up, getting down wasn't so bad as I found my footing quite quickly. It was to be for one night only and I could deal with that for the experience alone. The short trip from Lanzhou to Xining flew past literally, another Muslim city within China's northwest that I must visit! The landscape changed dramatically as we left Xining, soon enough it was only the harsh open landscape for miles! With no door to close on each compartment it was great to hear the chattering Chinese conversations, I had packed with me some instant noodles and a few other bits for the journey including a beer or two to get over the height and craziness of my sleeping situation. Day turned into night, with lights out at 10 pm prompt it gave me the chance to have a sound sleep, the change in oxygen was something to deal but with the motion of the train and the surprising good quality duvet I slept soundly until 7 am. My actual camera is shockingly bad for moving shot so I relied on my iPhone heavily, making our last stop in Gansu Province the previous night after 9:30 pm we had reached the Tibetan side of the vast Plateau. The views that passed me were unstoppable, unforgettable and unimaginably beyond anything I had previous expected them to be. I adored the simplicity of the Tibetan homesteads as it felt like the train was passing through a Tibetan wild west! Of course I was living! Getting off the train was a relief to say the least, it hadn't felt like I had imagined it was going to be as the journey time flew past. Going through the exit of Lhasa Railway Station I was ushered into a separate building without my documents in my possession, another passport and permit check needed to be done! For a moment I didn't see the Tibet Vista logo or even my name but after looking close enough I found 'Phurbu' who was my tour guide. I don't do group tours but travel in Tibet is restricted for citizens who aren't Mainland Chinese people, I was prepared to adapt my way of travelling for this special once in a lifetime trip. Lhasa's new city looked like a shell, complete with a brand new feel that didn't give me life but we were on the way to the old city that would be the winner of that competition! It felt amazing making it to Lhasa after such a long journey and waiting for close to a year made it worth everything! Go, T! Passing the Potala Palace didn't feel real, the symbol of the Dalai Lama passed me by as the minibus made its way to my hotel, it was reality but it felt like I was dreaming! Beijing East Road bustled and got on with its hustle serving its white-washed Tibetan style buildings, the old city had so much life it made the new city look sterile and dormant! Checking into my hotel didn't take much stress but my previous reception experience challenged a few issues that I had during the first night. Lunch was tasty, I had a Tibetan Bobi that was like an Indian Chapati served with chicken and a cool Raita. Making the most of the free time I found a quiet Tibetan tea lounge, I had some milk tea and tried Yak Butter tea for the first time, ordering a potato dish for my tea was amazing, that dish had an Indian flavour for sure! Chilled out and centred I went mad by buying a tonne of incense sticks as Tibet was the one! The tour would start the next morning, truly I was already in love with Lhasa, Tibet! Yes!